Growing population of the city, haphazard and unplanned development of industries and factories, huge rise in the vehicular population, aggravating traffic congestion and increasing air and noise pollution, poisonous gases emitted by burning of city garbage in four landfills There has also been an ever-increasing number of diesel vehicles plying on the roads, which are largely responsible for the air pollution. Professor. Sen as usual was preparing for his lectures when Kumar entered his cabin. Kumar was one of those studious, curious, committed students in the class. Kumar and some of his classmates regularly visit the Professors cabin and discuss matters relating to Economy, Policy and issues related to current affairs. Kumar was accompanied by some of his friends. Yes, Kumar tell me what is the question you have today said the Professor with a smile. Kumar who was caught up in heavy cold and cough was about to answer before which the professor asked him, Kumar by any chance you had gone to Delhi. Kumar was surprised, sir how did you find it. No magic replied the Professor, you dry cough is enough of proof and I could see your dusty face despite many attempts to clean your face. Other students laughed at him. Sir, that was a horrible experience, I could not go out. I wanted to visit many places said Kumar. Sir why is this so asked Kumar. Prof. Sen replied, Kumar, for this you should understand the concept, background and impact of Tragedy of commons. Every student looked at the Professor eagerly. One of the students Raj, asked, was it such a tragic story, like what happens in movies and college campus. Everyone laughed at him. No, Raj, it is a concept, The tragedy of the commons is a term used to describe a situation in a shared-resource system where individual users acting independently according to their own self-interest behave contrary to the common good of all users by depleting or spoiling that resource through their collective action. Ok, said Raj, who was expecting an interesting story. The concept and phrase originated in an essay written in 1833 by the British economist William Forster Lloyd, who used a hypothetical example of the effects of unregulated grazing on common land (also known as a "common") in the British Isles. The concept became widely known over a century later due to an article written by the American ecologist and philosopher Garrett Hardin in 1968. In this modern economic context, commons is taken to mean any shared and unregulated resource such as atmosphere, oceans, rivers, fish stocks and many more resources. The 'tragedy of the commons' is often cited in connection with sustainable development, economic growth and environmental protection, as well as in the debate over global warming. It has also been used in analyzing behavior in the fields of economics, evolutionarypsychology, anthropology, gametheory, politics, taxation and sociology,continued the professor. According to Prof. Garret Hardin, who quotes the famous angels and non angels theory of James Madison, the spoilage process comes in two stages. First, the non angel gains from his “competitive advantage” (pursuing his/her own interest at the expense of others) over the angels. Then, as the once noble angels realise that they are losing out, some of them renounce their angelic behaviour. They try to get the share out of the commons before competitors do. Thus, an unmanaged common in the world of limited material wealth and unlimited desires inevitably ends in ruin. Inevitability justifies epithet tragedy. True, said Raj one of the student said, the way we manage our public spaces is a classic example. Yes, said Prof. Sen, experts quote various examples such as Air pollution, Water pollution and crisis, burning of crops, fossil fuels, mining, bad roads, littering in public spaces such as parks, recreation areas, and public restrooms most of them are due to our disrespect to the common resources. Sir, is it tragedy of commons or tragedy by commons asked Kumar. Prof.Sen smiled and answered, Kumar, it is a tragedy caused by them to their own self. As, we discussed earlier, over a period of time the angels type common people also change their attitude and become non angels and as mentioned by Garret, an unmanaged common in the world of limited material wealth and unlimited desires inevitably ends in ruin. Sir, why should we always blame the public asked Raj. Well, answered Prof.Sen, there are many economic theories which debate on this issue. Can you explain asked Leena. According to literature, William Forster Lloyd, professor at Oxford, in 1832, noted that while the common land in English villages was often barren and infertile, privately owned, fenced pastures were just the opposite: they were often lush and fertile. Forester concluded that the farmer, like the rest of us, does not take the losses of the community as seriously as his personal losses. The prudent man, he wrote, determines his conduct by comparing his present pleasure to future suffering, and his present sacrifice to his future benefits. Many economist including Garret, favoured the existence strong private property rules minimizes this tragedy. Thus, one of the solutions for this problem is to convert common good into private property, giving the new owner an incentive to enforce its sustainability. That is nice to hear said Kumar, so the problem can be tackled by any private parties or public by themselves. But, this needs a good support from government, I think said Raj with caution. He did not want to be caught on a wrong foot this time and become laughing stock. Students as usual looked at him with smile. Governmental solutions may be necessary to support community or private sector participation for creating the above conditions. How is this possible Sir, asked Leena. Prof.Sen answered, for example, governmental regulations can limit the amount of a common good that is available for use by any individual. The government can bring stricter permit norms for economic activities including mining, fishing, hunting, livestock raising and timber extraction are examples of this approach. Similarly, limits to pollution are examples of governmental intervention on behalf of the commons. This idea is used by the United Nations Moon Treaty, Outer Space Treaty and Law of the Sea Treaty as well as the UNESCO World Heritage Convention which involves the international law principle that designates some areas or resources the Common Heritage of Mankind. Also, Privatization works when the person who owns the property (or rights of access to that property) pays the full price of its exploitation. As discussed earlier negative externalities (negative results, such as air or water pollution, that was created by the individuals but affects all) is often a feature driving the tragedy of the commons. Internalizing the externalities, in other words ensuring that the users of resource pay for all of the consequences of its use can provide an alternate solution between privatization and regulation. One example is fuel taxes which are intended to include both the cost of road maintenance and of air pollution. This solution can provide the flexibility of privatization while minimizing the amount of government oversight and overhead that is needed. However, Prof.Sen continued, many environmentalists criticize that the tragedy of the commons is used as propaganda for private ownership. They claim that it has been used by the investors to control the "common resources" of third world and indigenous people worldwide. Sir, can you explain this concept of externalities asked Santosh, another student. Well, Prof. Sen replied, Externalities occur when one person’s action affects other persons well - being and the relevant costs and benefits are not reflected in market prices. A positive externality arises when the public/society, citizens, at large benefit as a result of Public good work by the Government. For example, construction of new road to a village, bridge, providing free or subsidized education to poor children, public safety and so on. These results overall benefit to the society. A negative externality arises when the costs that pollution imposes on others. For example, manufacturing that results in air pollution imposes costs on the whole society. A negative externality occurs when an individual or firm making a decision does not have to pay the full cost of the decision. If a good has a negative externality, then the cost to society is greater than the cost consumer is paying for it. Since consumers make a decision based on where their marginal cost equals their marginal benefit, and since they don't take into account the cost of the negative externality, negative externalities result in market inefficiencies unless proper action is taken. The Professor continued, the Tragedy of Commons is a specific case of creation negative externality. In general in negative externality, we discuss about how an individual or firm in the society benefits at the cost of public or Society. Here in Tragedy of Commons, we face the challenge of how collectively the public due to their self interest abuses the limited resources and in turn cause harm to themselves or Society at large. Sir, the media says that the problem in Delhi is severe, said Kumar coughing and closing his mouth. According to some studies the air pollution contributed to a total of 80,665 premature deaths of adults over 30 years in Mumbai and Delhi in 2015, a two-fold jump from 1995. In economic terms, air pollution cost the two cities $10.66 billion (approximately Rs 70,000 crore) in 2015, or about 0.71% of the country’s gross domestic product. The study has said the impact on health and productivity as a result of exposure to pollution and the consequent burden of respiratory ailments rose with every passing decade. Researchers calculated impact using data on PM 10 (fine particulate matter measuring 10 microns), population and death rates. 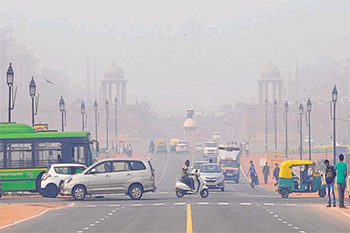 With its higher pollution levels, Delhi recorded more premature deaths due to ingestion of PM10 from vehicle exhaust, construction dust and other industrial processes. Casualties went up from 19,716 in 1995 to 48,651in 2015. In Mumbai, the comparative figure rose from 19,291 to 32,014 in 20 years. Air pollution was also responsible for 23 million cases of restricted activity days (RAD) — either less productive days or days off work for individuals — in the commercial capital in 2015. The worsening quality of air in the city also led to 64,037 emergency room visits in 2015 by those stricken by respiratory ailments, up by 35.4% from 1995. In comparison, in Delhi, there were 29 million cases of RAD and 0.12 million emergency room visits in 2015. One of the recent study by the World Bank is an eye-opener. Its evaluation of the damage to health from a gamut of environmental factors—including air pollution, inadequate water supply and poor sanitation—shows outdoor air pollution takes the maximum toll in India. This is followed by indoor air pollution. My God, the students reacted listening to the information. Prof.Sen continued, According to the global Environment Performance Index (EPI) 2018, India is ranked at 177 with an EPI of 30.57, and it is disheartening to hear that Delhi, the national capital of the country, is being tagged as one of the most heavily polluted capital cities in the world. It is the world’s worst city in terms of air pollution, with an unhealthy air quality index for the majority of the year. Thus, today, one of the biggest threats to the welfare of the people of Delhi and the city as a whole is pollution of various types ranging from air pollution to industrial waste. It has been reported by another study that everyday almost 8,000 m tones of solid waste is being generated in Delhi. On an average, everyday, the MCDs and the NDMC manage to clear about 5,000-5,500 m tones of garbage. This results in the accumulation of more and more garbage in the city. There has been too much dependence on fossil fuels like coal-fired power plants, improper use of energy in buildings and the excessive use of biomass for cooking and heating, etc. According to the Ambient Air Pollution (AAP) report for the year 2014, Delhi had PM 2.5 pollution levels, which is the highest in the world, followed by Beijing. This result was based on the monitoring of PM measurement of outdoor air pollution from almost 1,600 cities in 91 countries. According to the WHO, air pollution is the fifth largest killer in India. Carbon monoxide (CO), a dangerous gas emission, is around 6,000 microgram per cubic metre in Delhi, which is much above the safe level of 2,000 microgram per cubic meter. Another major reason quote by political parties and the media is the burning of crops by neighboring states said Raj. And there is a lot of politics over it replied Leena. The students laughed and Raj replied, they are not concerned with any solution. Sir, how does this burning of crops create pollution asked Kumar. Prof.Sen replied, according to the media quoting the political leaders, “In Haryana and other states, the crop is cut from the top using technology, so it leaves long stubble which needs burning for removal. In Delhi, the farmers cut crops close to the roots. Sir, how does the crop burning affects the air quality asked the students. Prof.Sen replied, although Delhi witnesses a spike in particulate matter PM2.5 limits round the year, the ambient PM2.5 concentrations show spikes in October-November, which is also the peak season for harvesting, when abundant crop residue is burnt by farmers to prepare for next crop. According to studies, extreme fires during the post-monsoon season can pump more micrograms per cubic meter of fine particulate matter into the city, doubling the amount of pollution. The harvesting season coincides with the post-monsoon conditions. These conditions allow smoke to slowly permeate throughout the region including Delhi. This smoke mixes with existing pollution from cars and factories creating a thick, deadly haze. Prof.Sen replied, the government has been initiating solutions for this dilemma. There are steps initiated by the government such as tightening of mass emission standards for new vehicles, ban imposed on the plying of more than 15 years old commercial/transport vehicles, taxis and autos that run on conventional fuels, including diesel driven city buses, Steps are taken to transform garbage into compost by developing new sanitary land-fill sites, construction of Mass Rapid Transport System (MRTS, Government has constituted a committee to implement the Bio-Medical Waste, The Delhi Degradable Plastic Bag (Manufacture, Sale and Usage) and Garbage (Control) Act 2000 has been enacted for banning the manufacture and use of plastic bags, etc. Government has banned the manufacturing of BSLV III engines, and implemented policy to ensure that only eco-friendly engine is manufactured. We all should abide by the 3R rules: Recycle, Reuse, Reduce. It is the duty of every citizen to think in a broader perspective to control pollution. 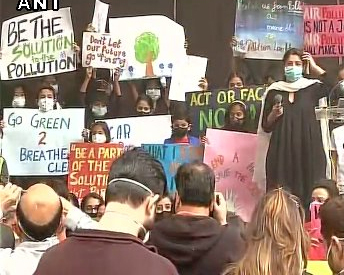 We really don’t want our future generations to live in an unhealthy environment in Delhi. We should take a pledge to do what I can for my environment and protect it to the best we can. If each one of us takes a pledge to do our bit for our environment, I am sure not only Delhi, this country why not the whole world will be a better place to live in. Every small step counts, replied the Professor with a smile. Yes Sir agreed the students and thanked the professor for the fulfilling profound knowledge and awareness they gained during this discussions. Sir, we will be a part of this great cause and will take every small step to support and solve said, Raj. Happy to hear this, you will make the future generation also happy, peaceful and sustainable, replied the Professor. The students left with a new found motivation, the Professor took his book again and immersed himself into it.